Jimmy had a variety of toys as a pup but his favorite was very unusual — a pink flamingo. Stephanie and I had received this large plastic bird as a gag-wedding gift a few years earlier. I presented it to Jimmy shortly after he arrived at our home, and he took to it immediately. Right away, he pounced on it, picked it up by its neck and carried it around the room, despite the fact that the three-foot-tall flamingo dwarfed Jimmy’s short, puppy frame. He often carried it around with him, occasionally stopping to chew on it. We kept the flamingo in Jimmy’s plastic toy box, its head and neck towering above the rest of his possessions. Sadly, we eventually had to throw it away because it started to break into pieces. 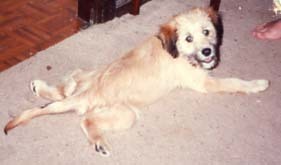 Jimmy as a puppy. He was SO cute and sweet. We didn’t know then that he was born with hip dysplasia and that was the most comfortable way for him to lay. Never saw Jimmy’s “baby” pix before! This is adorable!